Guardian Independent Certification(Beijing)Company Ltd is a Sole proprietorship enterprise by GIC. The Company is accredited by Certification and Accreditation Administration of People’s Republic of China (CNCA) for certification of quality management system under the license number:(CNCA-RF-2005-43). 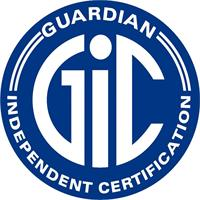 Incorporated in 1994 in the United Kingdom,Guardian Independent Certification Ltd (GIC),a wholly owned subsidiary of GIC Group. is one of the leading certification bodies in the world.GIC main business is Management System Certification and Training. The Company’s leading position is achieved through its emphasis on impartiality, quality and competency.